Like Five-Card Stud, the object of the game is to make the best poker hand with five cards. However, rather than be dealt five cards, the player is given just three cards. The two remaining cards come from the community hand, which are two cards initially dealt face down so that no one knows what they are. Each player uses the community cards to complete their hand. The initial wager must be divisible by three – as the game is broken into three parts: the original three-card hand, after the first community card is revealed, and after all five cards are revealed. So the same chip amount is placed in three different spots on the table. 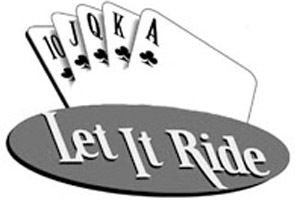 In some games, players are offered three chances to wager during “Let It Ride Poker”. They can raise their initial ante following the first dealing of their three cards, raise when the first community card is revealed and raise again when the final and fifth card is shown. And, unlike most poker pots, “Let It Ride” players have the option to withdraw one-third of their original wager twice during a hand: First when the three-card hand is originally dealt and second after the first community card is turned over. If a player passes on these opportunities, they will “Let It Ride” – hence the name of the game. Like the majority of video poker games, different hands hold different payouts. The bigger and more rare hands obviously carry a larger payout than a hand of a pair 10s or higher (1/1) or two pair (2/1). A Royal Flush is the biggest winner, carrying a payout of 1,000/1. A straight flush is 200/1, Four of a Kind is 50/1, and a Full House is 11/1. A Flush pays 8/1 odds, a Straight at 5/1, and Three of a Kind pays out at 3/1.